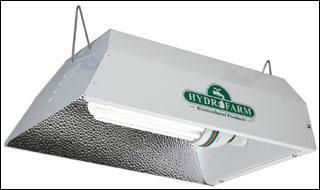 A 100W compact fluorescent bulb and fixture from a hydroponics equipment dealer. You won't find these at the home improvement stores. Welcome to our page about compact fluorescent bulbs. While many folks are familiar with larger "glowtube" office lights and shop lights, and the much smaller fluorescent bulbs for use in household lamps. However, this lighting technology also has a variety of uses in horticultural applications. Those bulbs are often designated as "High Intensity Discharge" or HID bulbs, to distinguish them from more common household bulbs. HID Compact fluorescent bulbs intended for horticultural production enjoy the same benefits, and the same drawbacks, as their household cousins. 1) They are now available in a variety of wattages, which also determines their brightness and how much area they can illuminate. 2) Like other compact fluorescent bulbs, they screw into a standard light socket without need for any special additional fixtures. The bulb's ballast is built right into the bulb housing. Once you've determined the size you need, simply provide a standard light socket with a standard power supply, and you're ready to go. No separate ballast, no special wiring. Having said that, most horticultural applications will want to use a reflector (such as the example in the photo) to ensure that as much light as possible reaches the plants below, rather that the ceiling above. While you might find the bulbs themselves at hardware stores, the reflectors are available only through horticultural dealers. Those are preferred because they help you get every last photon of light out of your fixtures and down to your plants. Many such reflectors also have features such as shatter protection in case a bulb bursts, and/or protection from water infiltration from either high humidity or accidental spray during irrigation. 3) Additionally, they don't give off a great deal of heat. So they can be set up very close to seedlings or plants with zero risk of burning the leaves or creating a dangerous heat buildup. This is particularly important when growing in confined spaces that otherwise would be prone to dangerous overheating. 4) These bulbs fill the void between standard shop fluorescent tube fixtures, which are typically at least 24" long, and the much smaller (and dimmer) light bulbs typically used within household lamps. As such, they can very nicely light up areas too big for household bulbs but too small for shop fixtures. 1) Because these bulbs are not very big, plants may outgrow their light output. If you are growing veggie crops like squash, tomatoes or others which start small but become very large, you will eventually need to switch to another light source. 2) Because these bulbs are still relatively uncommon, they are special order items and as such will cost more per lumen than other lighting sources. If your growing area is a small enclosed area, for instance in a terrarium or small room of the house, they might be the best fit. But for larger areas, other lighting sources would ultimately cost less. 3) The convenience of having that ballast built right into the bulb comes back to haunt us when we have to replace the bulb. I don't have any solid proof of what I'm about to say, but I suspect a lot of the relatively high price is due to the built-in ballast. If the bulb has given us a lot of hours of service, that's not a problem. But if we break the darn thing within a few hours of buying it, that becomes a sore spot very quickly. 4) Many of these bulbs will not operate at low temperatures, for instance 45F or lower. This is an issue with fluorescent bulbs in general, and is due to the temperatures at which the gases within the bulb can fluoresce. Some bulbs are specially designed and rated for low temps. That usually is not an issue for veggie growers since presumably we're keeping our grow areas warmer than the minimum temps required for most bulbs. Just be aware of that low-temp limit if you happen to need yours for outdoor use. We have used HID compact fluorescent bulbs for a variety of specialty purposes around the farm, including but not limited to seedling growth and high-light needs in compact spaces. The most common use for them is when I'm starting high-value veggie crops, such as pepper, tomato or squash, in the house during the early spring months when outdoor conditions are still too frigid. We also currently have them in our poultry houses, because they provide greater light at lower cost in those smaller areas. We are careful with the bulbs so that we don't break them, since they are so costly to replace. We have other lighting sources for our veggie plants when they get larger, and/or for growing out larger areas. But these definitely fill several niches here which would be difficult to fill otherwise. Compact Fluorescent bulbs are still a little harder to find than many other types of HID lighting. As a result, they are generally only available through online retailers, and by special order through hydroponic supply houses. They may occasionally be available via special order through home improvement centers. In the right-hand column, we have provided some links to a variety of bulbs from several different manufacturers, all available through Amazon.com. The good news is that these bulbs are gaining in popularity and as a result, more sizes are now available than when they were first introduced. Now a variety of wattages can be purchased to meet fairly specific brightness needs. One such example of this variety comes from Grener's Hydroponics website, which offers a range of compact fluorescent grow lights.